What is a Pennsylvania Promissory Note? Pennsylvania Promissory Note: What Is It? A Pennsylvania promissory note is a written contract between a lender and a borrower. It documents the existence of the loan and how it will be repaid. Pennsylvania promissory notes may be secured or unsecured. When a promissory note is secured, the lender is promised a specific piece of collateral if the borrower does not repay the loan as promised. A car loan is an example of a secured promissory note. If the borrower doesn’t make their payments or uphold the other terms of the agreement, the lender has the legal right to take possession of the vehicle that is documented in the agreement. An unsecured promissory note does not promise any sort of collateral if the borrower doesn’t pay as promised. What Is the Maximum Amount of Interest That May Be Charged in Pennsylvania? In Pennsylvania, the maximum amount of interest that may be charged depends on the amount of the loan and whether there is a written agreement. If the amount loaned is less than $50,000, the maximum interest rate that may be charged in Pennsylvania is 6%. For loans greater than $50,000 or if the agreement meets another exception within the state’s usury law, the interest rate may be whatever amount the parties agree to in writing. The date the Pennsylvania promissory note is created. This date is placed below the title. It is written as month, day, and year. This date, and the date the document is signed, is extremely important because it helps to provide the validity of the document between the parties. The dates also help establish legal deadlines for certain types of actions related to the promissory note. Identifying the parties and their individual roles within the agreement. Use the legal name of each party regardless of whether they are an individual or an entity. Parties include the lender, the borrower, and sometimes a co-signer. Here’s an example: ABC Car Loans, Inc., Lender; John Q. Doe, Borrower. The mailing address for each party. It’s important to use the full address, including the city or town, state, and zip code. For secured promissory notes, the physical address for the borrower and any co-signer should be included if it is different than the mailing address for each. If the lender has a payment mailing address and a general mailing address, the general mailing address should be listed here. The payment address should be listed in the payment agreement for easy reference. The principal amount loaned to the borrower. This is the full amount loaned to the borrower. It does not include interest. It is important to make sure that this number is correct before the document is executed and becomes legally binding. The yearly interest rate charged for the loan. This is the amount of interest charged by the lender. It is often expressed as per annum or as the annual percentage rate (APR). Payment agreement. This section details how the borrower will repay the loan. It includes the number of payments that must be made, the due date for each payment, and the amount of each payment. If the lender charges a late fee for missed or late payments, the amount of the fee should be documented in this section as well as when the lender will charge it to the account. If there is a payment processing address, it should be listed in this section of the promissory note. For secured Pennsylvania promissory notes, include a description of the collateral. Without this description, a court might treat the agreement as unsecured if there is a disagreement. Interest Due in the Event of Default. 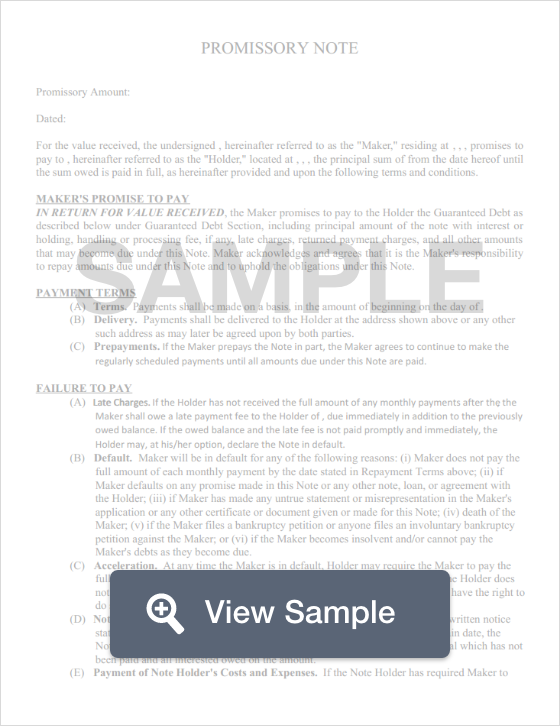 Borrowers who do not follow the terms and conditions of the promissory note may be charged a higher interest rate than initially agreed. That amount of interest is listed here, but it should not exceed the state’s maximum interest rate. Payment Allocation. This clause explains how the payments made by the borrower will be split between the principal balance and the interest charged. Prepayment. If the borrower wants to pay off their loan early, this is known as prepayment. This clause explains whether the borrower will experience a financial penalty for paying off the loan before the end of the term defined in the payment agreement. Acceleration. This is the lender’s legal right to demand immediate repayment of the outstanding balance if the borrower does not follow the terms and conditions of the promissory note. Attorney Costs and Fees. This clause explains how attorney costs and fees of one or both parties will be handled if there is a legal dispute related to the Pennsylvania promissory note. Waiver of Presentments. This clause states that the lender is not legally required to be physically present when the borrower makes payments. Severability. A severability clause protects the remainder of the promissory note if one portion of it is found to be unenforceable. Conflicting Terms. If the note has conflicting terms, this clause explains how those terms will be clarified. Notice. A notice clause states whether the lender will notify the borrower if the lender plans to sue over the agreement. Governing Law. This clause documents the state whose laws will be used to litigate or mediate any legal dispute related to the note. Most Pennsylvania promissory laws do not require a notary. However, promissory notes related to repaying loans for real estate may require notarization. To execute a Pennsylvania promissory note, it should be signed and dated by the borrower and any applicable co-signer.